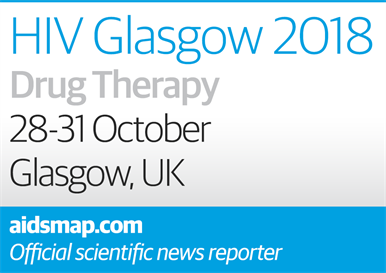 The International Congress on Drug Therapy in HIV Infection (HIV Glasgow) is taking place in Glasgow, UK, from 28 to 31 October. NAM is the official provider of online science news for the conference. Dolutegravir and neural tube defects. For more information on the conference, visit the official conference website at hivglasgow.org and view the online scientific programme. NAM will be publishing news online at www.aidsmap.com/HIVGlasgow-2018 and sending out a round-up of news in a summary bulletin in the week after the conference. The bulletin will be available in English, French, Spanish, Portuguese, Russian and Italian. Sign up here for the bulletin. You will receive this bulletin automatically if you already subscribe to our regular news bulletins. NAM works to change lives by sharing information about HIV and you can help by sharing links to the research presented at the conferences. So please feel free to link to our news stories, bulletins and any other aidsmap.com pages – in emails, newsletters and blogs or in other social media like Facebook and Twitter.